Opportunity and risk are keys to the success of the art dealer: taking advantage of a situation that you find yourself faced with, and taking a chance that your belief in a work of art will pay off in the end. Of course, ‘paying off in the end’ has different meanings to the dealer, collector or museum curator. The dealer needs to see the possibility of a literal payoff in order to stay in business. The curator needs to be proved right in order to keep the trust of her/his colleagues, director and trustees. But the collector need only to continue to enjoy her/his acquisition. Being accused of being an opportunist is generally considered to be a criticism. Not so in the art market where it is a wise path to follow if you believe in what you are acquiring. In fact it can be taken as a compliment. Museum curators and art dealers worth their salt will take advantage of an opportunity though the acquisition may not be on their pre-determined desiderata list. Dealers, curators and collectors all have wish lists, but they also know that once in a while, because someone, somewhere has fallen on bad times, died or just changed their way of thinking, a unique work of art becomes available that should not be passed up because the opportunity may not come again. I recently had such an opportunity. Though I am best known as a dealer in French 18th century and other old masters I acquired a collection of Paris School pictures of the early 20th century which are on view in Master Drawings New York this week. They were all acquired over a half century and are quite fresh to the market. Another reason that serious collectors, be they professional or private, acquire a work of art is because they just plain love it. It speaks to them. In rare circumstances even museum curators and directors will take a chance on an acquisition that they just have a hunch about. Dealers, of course, do this more often and sometimes their hunch cannot be satisfactorily proven out no matter how hard they work on it. Like every dealer I have several such works. Right now, as a matter of fact, I have one I could use your help on. 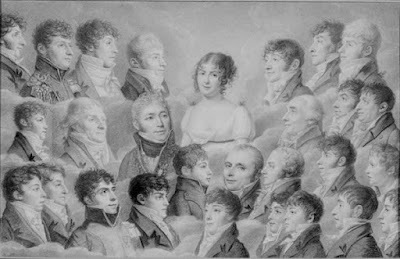 It is group portrait of a woman surrounded by men. We have titled it “A Lady Surrounded by Her Admirers”. At various times it has been attributed to Jean-Jacques Karpff, called Casimir, and Jean-Baptiste Isabey. The name of Leopold Boilly has also been mentioned. Recently, however, a scholar suggested an intriguing alternative. The son of Louis-Léopold Boilly, Julien-Leopold Boilly, who did graphics in very much the same vein as his father. Here also we have the mystery of the subject being depicted. It fits into the category of group portraits of an artist’s atelier popular in the early 19th century. Could, however this lone young lady who is surrounded by gentlemen of all ages be a beloved teacher in a reunion of her many students. Any ideas? Come and tell us what you think and we can show you some of the comparable images.